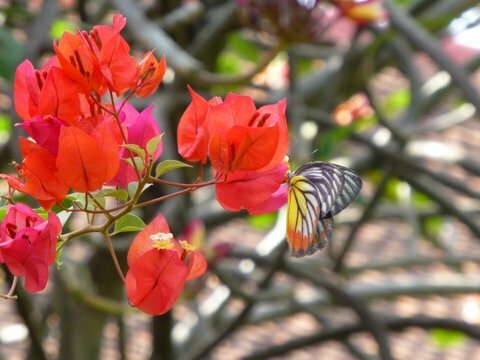 A day after visiting the genocide museum in Phnom Penh, it’s good to see beauty in everyday things. Life continues and the pendulum swings in the search for balance. 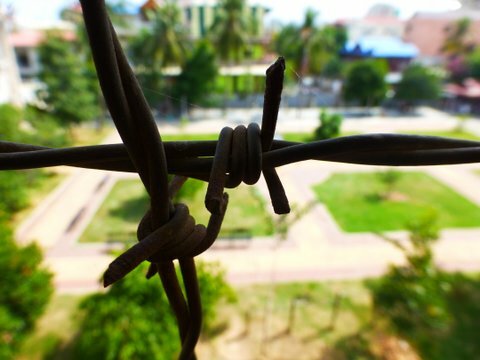 -k.
Beyond the barbed wire fence is the courtyard of the school turned torture prison in Phnom Penh. Over 20,000 people were tortured at Tuol Sleng school when the Khmer Rouge turned it into S-21, one of the places they used to extract confessions of individuals who they would later exterminate in the ‘killing fields”. This is one of hundreds of similar prisons throughout Cambodia and a harrowing reminder of man’s inhumanity to man. -k.
I am not a morning person. The heat of the day has forced us to get on the road earlier and earlier. But the advantage is seeing the world in glorious morning light. 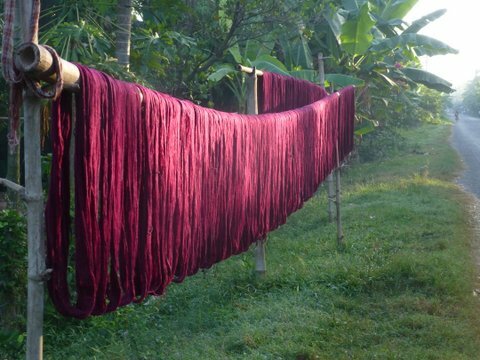 Here, dyed silk hangs out to dry on the road south of Kampong Cham. 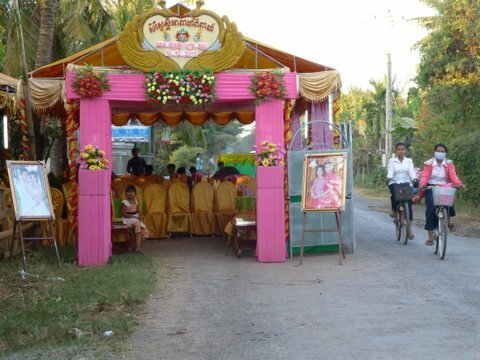 It’s wedding season in Cambodia and roads are springing up tents with bright sashes. 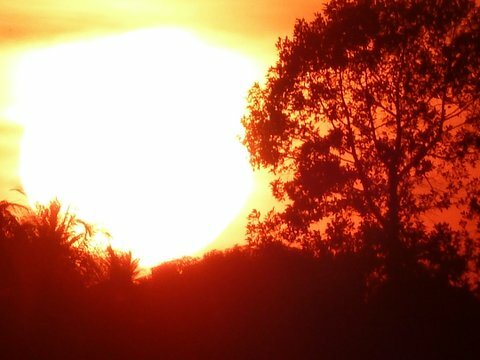 Since we get on the road at dawn and try to finish pedaling for the day before sunset, we’ve yet to see a party in full swing. We can tell we are approaching a wedding party site since the sound system is as bold as the color schemes and they are required to blast music during setup and take down. 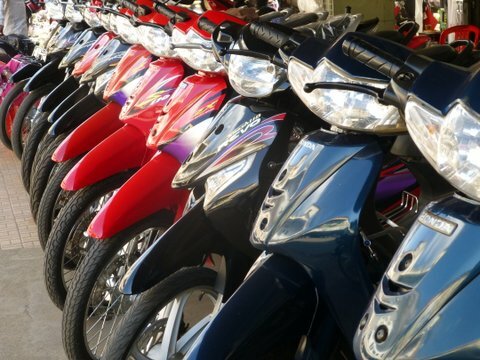 -k.
Those good, old machines don’t ever really die, they gets recycled in SE Asian markets. 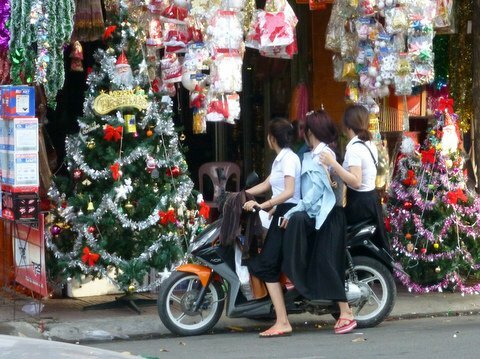 We passed at least 3 shops in Kampong Cham market that were floor to ceiling sewing machines for sale. 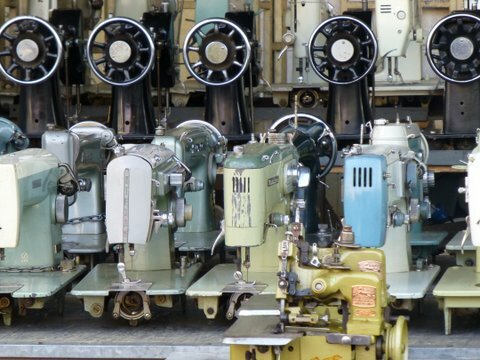 Perhaps there is a garment factory close by keeping the second-hand traders in full supply. -k.
Cane juice on crushed ice is now part of our daily life, and what a glorious thing it is. 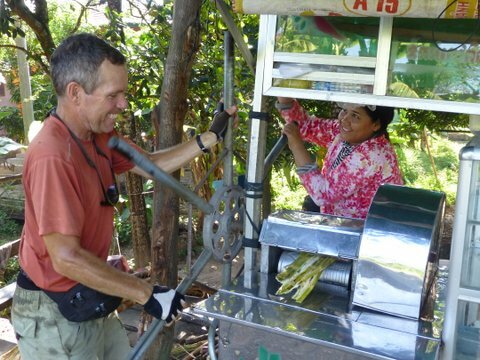 We now look roadside for the big wheel which turns the press and squeezes the peeled stalks of sugar cane. Those big wheels aren’t that easy to turn by hand, so Willie is known to jump up and help, much to the amusement of the locals. If you haven’t had fresh can juice, it’s slightly sweet with an earthy-grassy taste. Nothing cloyingly sweet about it. Simply refreshing, especially with just a squeeze of lime and a mountain of ice.-k.
Pajamas are all the rage in Cambodia. Often worn over a warm turtleneck sweater this time of year for extra warmth. For a while I even considered buying a cute set for my cycling kit. 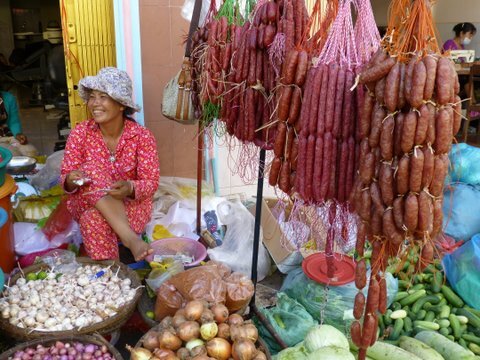 Usually they are in bright, cheery colors and flamboyant patterns that pop out, but here this vendor in the market blends in nicely with the cured meats. We’re a little obsessed with this fashion trend. 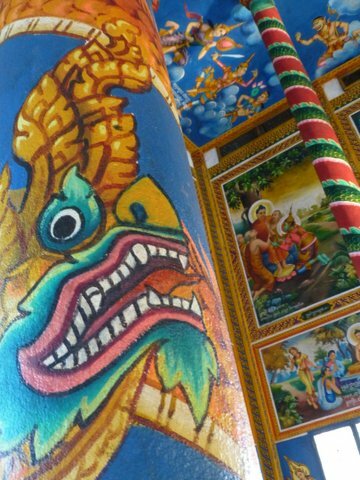 -k.
The 100-Pillar Pagoda in Sambour, Cambodia no longer has 100 pillars, but it has a lot of personality. What truly made this stop memorable is the group of Austrailians we met who were born Khmer and left Cambodia. They pooled their money and bought much needed food, clothing and medicine to distribute on their homeland tour. While those we spoke with felt that Australia truly was home, their hearts are deeply affected by the oppression witnessed every day here, and the pain and love they feel for Cambodia is palpable. 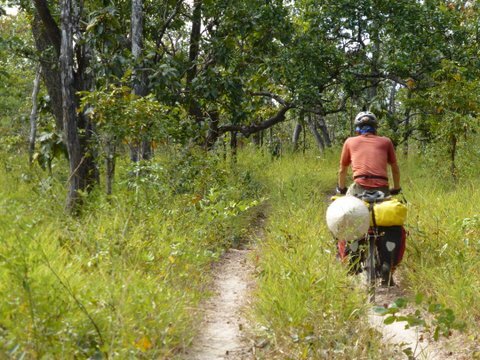 -k.
We are following some of the routes in the “Mekong Discovery Trail” and by far the most challenging is the ride down the length of Roungeav Island, the largest island in the Mekong river. The route follows rough and sandy ox cart tracks, which sometimes fade away or come to intersections with no direction. 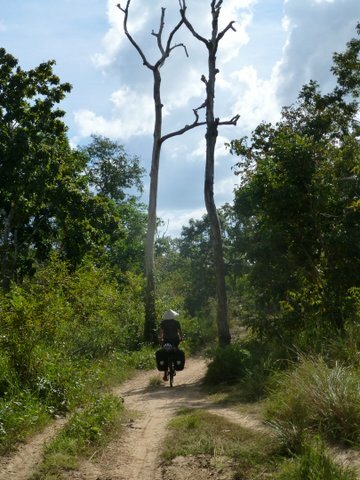 We spent much of the morning pushing our loaded bicycles through sand, but after lunch and a rest in the shade, the center of the island had a firmer dirt track through the forest. -k.
The Koh Khnhaer greeting committee gathered as we walked through the village of one of our homestays along the Mekong. They joyfully say “hello” again and again and follow us as we walk up and down the one street town. 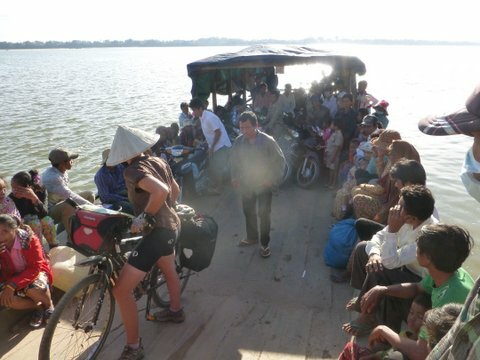 The signs of poverty make it clear why NGOs are trying to bring tourist dollars to the upper reaches of the Cambodian Mekong. It’s a hard life, but you wouldn’t know it by the laughter from these children. Not a one asked for money or treats, they only wanted waves hello — to be seen. 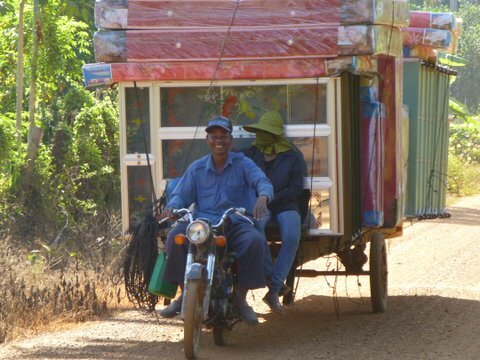 -k.
We see all kinds of improbably things sold along the dusty back roads of Cambodia, and this is one of my favorites. This is the mattress and dresser salesman, toting stacks of mattresses and what I hope is plastic (not glass) dressers. And now that I think of it, there is no mattress store. Barely any stores at all that have more than a few packages of shrimp chips and sweet drinks. 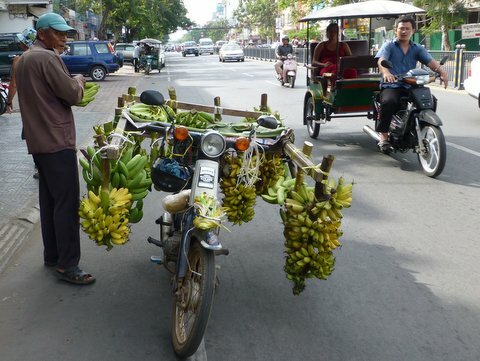 Everything and anything is sold by this kind of roving scooter salesman. -k.